Insulating tape makes a good bandage. Now here's a rare problem on Mull. The low winter sunshine was blinding the drivers coming up the Hill Road late this afternoon. Never have you seen such a motely collection of sun glasses, from carboard cut outs with sweetie papers to Boots specials, and even some glamorous shades from all the top brand labels, like Lidl, Aldi and Poundshop. Whatever, it's been that sort of afternoon. High speeds and huge crowds, especially over Mishnish. John MacCrone put pedal to metal on the second loop of those three tests over Mishnish, Hill Road and Killimor. "That was much better," said John, "We had a good tyre and decided to push. Peter took a bit of time out of us earlier and the car felt good. I think we've taken about 10 seconds off the Mishnish record over there as well," adding, "the crowds were brilliant especially in Mishnish." Looking a wee bit dejected, Peter Taylor was being hard on himself: "I stalled it again in that middle one of the last three,"" dropping 11 seconds to MacCrone in one stage alone." And perhaps he tried to hard in the last one: "I had some huge moments in there." The grin was back at the recollection. 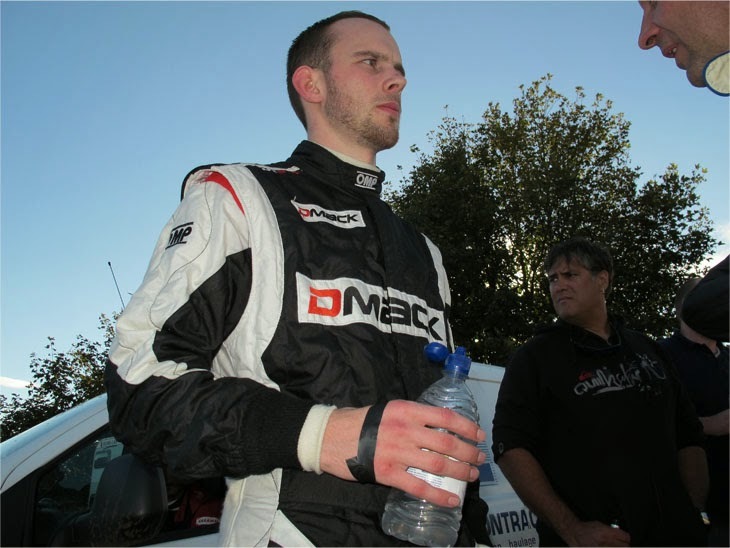 Eddie O'Donnell is still third but the gap to Tony Bardy has been reduced: "I got a puncture over the Lochs," said Eddie, "a lot of stones had been pulled out over the first loop of stages, and I think it just nicked a stone." That cost him over 20 seconds to Bardy. Tristan Pye is still fifth from Alan Gardiner, Leiws Gallagher, Jonathan Mounsey, Richard Cook and Peter Gibson moving into the top ten in his Lancer. And now day turns to night. Once more the crews will battle the gods of darkness on this mad mental dash around the sinuous, tortuous tarmac of this sainted isle. This battle is far from over. There are still 50 miles of stages left to determine the winner of the 2013 Tunnocks Mull Rally. Anything can happen out there tonight. There is just one other point, MacCrone is carrying an injury. You should see the size of the blister on his right hand. It nearly put me off my tea. But this is steak pie night in the Salen Hotel - nae chance!